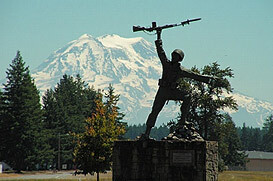 Fort Lewis and its real estate, named after Meriwether Lewis of the Lewis and Clark expedition, is one of the largest and most modern military reservations in the United States. You will find that thousands of active and retired military personnel living in and around the Pierce County real estate market. Many of those working in Fort Lewis and McChord Air Force Base have homes and houses in neighboring towns and cities, including Lakewood, Lacey, Spanaway and Tacoma. For soldiers, airmen and marines arriving to Fort Lewis, off-base housing is both affordable and plentiful. Fort Lewis real estate and the Pierce County area offer numerous activities on and off post for military families and friends. There are thousands of Fort Lewis MLS listings to search for in Pierce and Thurston Counties.